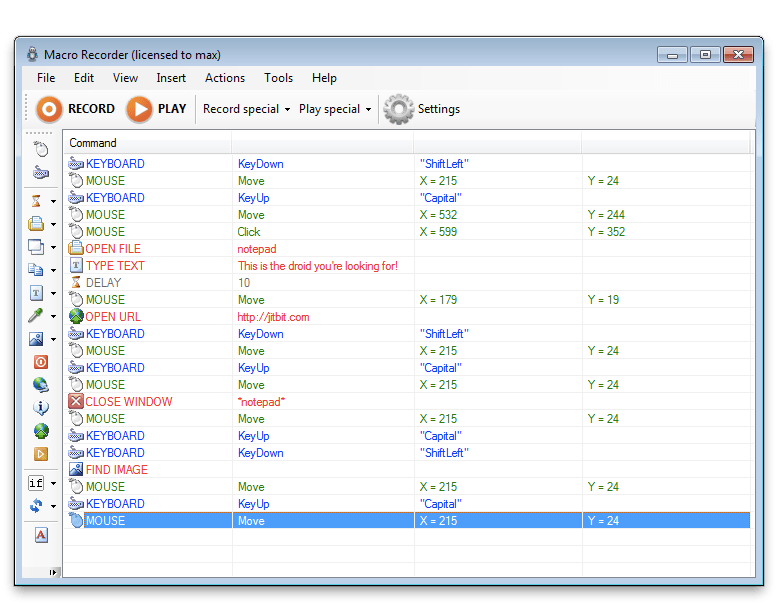 There’s a program called Macro Recorder by Jitbit Software, it pretty much does what it’s called and I can’t say I’ve fully tried all macro recorders out there, but this seems to be nicely done, not abandoned and not very expensive – relative to the others I found which had one of these flaws. What it does is it allows you to record keyboard strokes and mouse movements (also clicks/presses). If you have a repetitive task that you do not wish to waste time and effort doing over and over again, also wearing out your keyboard or mouse, that’s when a macro program comes into play. As for my suggestions. The only way to really improve it is to listen carefully to the requests and suggestions of the users as that’s how you can really improve functionality, because they’re the ones that will come up with every crazy situation possible, in a real environment – in my view at least. Personally one of the issues I have with it is when you require it to press Shift+F4 or Alt+F4, those two lines ends up being 6 as it wants you to Shift DOWN then press that F4 then Shift UP, same for the Alt and others. Yes that’s exactly what you’d be doing on a keyboard and if you wanted to do that, then that’s perfect, but if we’re trying to keep it as clean and compact as possible, that’s making this a lot longer than it has to be if your macro is getting a bit too long. And that’s the whole objective, to cut out the clutter and get straight to the point. Also I still have yet to fully understand what the “EXIT LOOP” statement does and how you would use it. The speed settings could be a bit more advanced than the simple slider. For example, giving the choice of going in real time or half fast/slow or x2, etc for me is a bit more understanding. The company itself seems down to earth with some of what they say, which I like so I will continue to watch this and I get a little excited when I see it update! Jitbit Macro Recorder. This entry was posted in Review, Software and tagged micro, micro recorder, recorder, software on June 6, 2014 by Savas.